When Paha Sapa, a young Sioux warrior, "counts coup" on General George Armstrong Custer as Custer lies dying on the battlefield at the Little Bighorn, the legendary general's ghost enters him - and his voice will speak to him for the rest of his event-filled life. 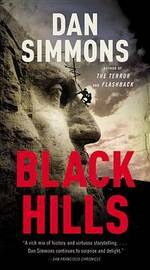 Seamlessly weaving together the stories of Paha Sapa, Custer, and the American West, Dan Simmons depicts a tumultuous time in the history of both Native and white Americans. Haunted by Custer's ghost, and also by his ability to see into the memories and futures of legendary men like Sioux war-chief Crazy Horse, Paha Sapa's long life is driven by a dramatic vision he experienced as a boy in his people's sacred Black Hills. In August of 1936, a dynamite worker on the massive Mount Rushmore project, Paha Sapa plans to silence his ghost forever and reclaim his people's legacy-on the very day FDR comes to Mount Rushmore to dedicate the Jefferson face. Dan Simmons is the award-winning author of several novels, including the New York Times bestsellers The Terror and Drood. He lives in Colorado. Visit www.dansimmons.com.